The easiest way to put up on any occasion is by gearing a Necklace Set, these are the ones with matching earrings and authentic look for any occasion. We have a range of necklace set which includes, heavy necklace set, designer necklace set, meenakari necklace set, antique necklace set, CZ necklace set, Polki Necklace Set, Kundan Necklace Set. We are known to produce and sell 100% genuine products, like our CZ Necklace Set that serves as the perfect reflection of traditional Indian artistry. 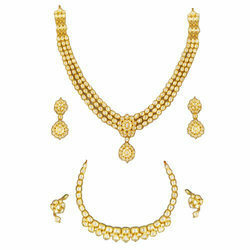 Moreover, these sets are ideal to be worn in traditional occasions, celebrations and functions. For the convenience of our clients we present here a huge selection of beautifully carved Meenakari Necklace Set with kundan beads. 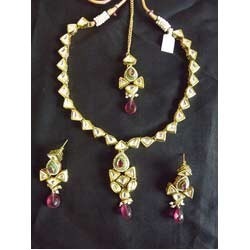 We are affianced in manufacturing and distributing a wide range of Fancy Necklace Set to our clients. These chains are designed in unique and contemporary designs, making them very stylish and elegant in looks and are designed by our expert jewelry designers. 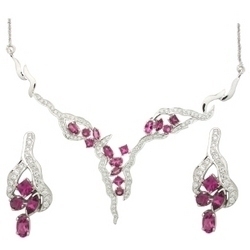 Here we offer the unique ones which flairs the emotional connect of Heavy Necklace Set with gorgeous feel and vibrant colors. Moreover, our designers help to offer exclusive and alluring designs of bridal long heavy bridal necklace range.